For most of his life, Tony Berlant has surrendered himself to his obsessions. Aside from making his own large-scale collages from vintage metal street signs and advertisements, the Santa Monica painter and sculptor has spent decades collecting ancient objects made by unknown artists. In 1974, he co-founded the Mimbres Foundation to study and preserve pottery produced by the Native Americans who inhabited Southern New Mexico roughly 1,000 years ago. Today, his collection of ancient pottery is rivaled only by his collection of Paleolithic tools, some of which date back more than a million years. This year Berlant’s obsessions have produced a pair of museum exhibitions and two accompanying books. His ceramics collection is on view through December 2 at LACMA, in an exhibition he co-curated alongside scholar Evan Maurer. A separate exhibition of his Neanderthal tools, co-curated alongside anthropologist Thomas Wynn, closed in April at Nasher Sculpture Center in Dallas, Texas. The objects have since been returned to what Berlant likes to call the “hand axe hotel,” a chest of drawers that sits at the center of the Santa Monica studio where he’s lived and worked for nearly 40 years. On a Wednesday afternoon in late August, the studio feels more like a factory, with assistants cutting sheets of printed metal into tiny shapes that will later be assembled into collages. 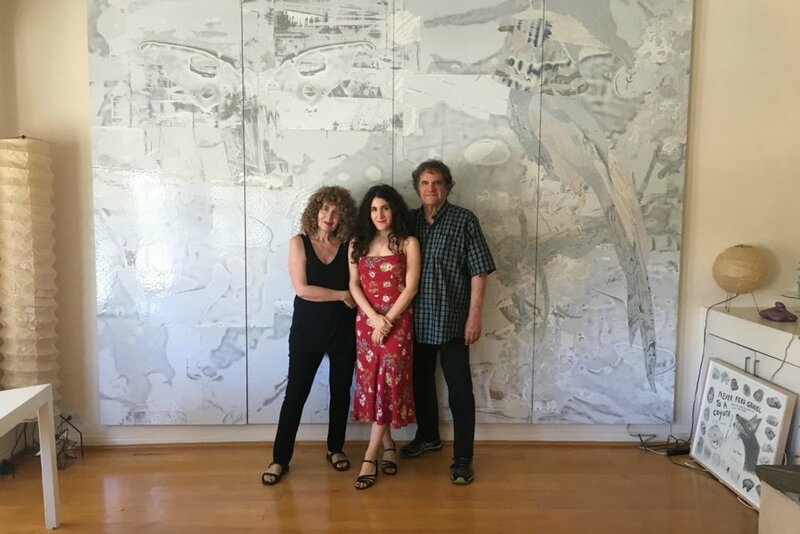 Berlant recently doubled the number of studio assistants he employs—from two to four—to help him prepare for Fast Forward, which opens September 22 at Kohn Gallery in Hollywood. It marks his first solo exhibition since joining the gallery last year after more than three decades at L.A. Louver in Venice, and it includes his most personal work to date: a collage featuring a Polaroid of himself taken by Andy Warhol in the early ’70s; a collaged portrait of his wife, Helen; and a blown-up photo taken by comedian John Early of Berlant’s daughter, stand-up comedian and actor Kate Berlant, performing at a Hillary Clinton benefit in 2016. It’s a bolder, more vulnerable body of work for Berlant, who admits part of the reason he talks so much about prehistoric objects is because he is uncomfortable discussing his own art. But after spending more than half his life researching and collecting ancient artifacts, the self-taught historian hopes he can finally put his obsessions to rest and focus on himself for a change. “Hmm. Comforting,” Kate Berlant deadpans with a smile. In her stand-up sets, she frequently incorporates the language of academia (she got her master’s degree in performance studies at NYU and considered getting her PhD before realizing it wouldn’t leave much time for comedy), corporate feminism, and wellness culture as a means of illuminating their absurdities. She lives in Silver Lake, on the other end of the city, but says she and her father “talk constantly.” The two have always been close. He still calls her Kitty, a childhood nickname, and as a kid, she called him mommy, because she thought he didn’t have a job. “He was here and everyone else’s dad was a doctor or wore a suit,” she says. Her mother, Helen Mendez, an actor and performer who worked with the Dadaist playwright Guy de Cointet in the 1970s and ‘80s, stayed home, too. “I had two mommies,” says Kate. One summer while attending New York University, where she created her own major she calls “the anthropology of comedy”—a title she now says is “embarrassing”—she worked with the artist Chris Burden to help him build a 65-foot skyscraper out of an Erector set. The experience, her father remembers her telling him, shifted her aspirations. The way he tells it, she no longer wanted to pursue a traditional career in comedy, but one marked by experimentation and collaboration. Berlant’s out-of-warranty years, it turns out, might just be his most prolific yet.